At nearly 70 years old, Kittie Weston-Knauer is the oldest female BMX racer in the United States. When she started competing in off-road bicycle races, or BMX, in the late 1980s she was often the only woman on the track. It was her son Max Knauer, a championship BMX rider himself, who introduced her to the sport when he was ten years old. While Max, now 40, is currently retired from the sport, Kittie has no plans to quit any time soon. She looks forward to the day she can watch her grandchildren hit the track — and hopes Max will start competing again with them, too. Top photo: Max Knauer and Kittie Weston-Knauer at their StoryCorps interview in Des Moines, Iowa on April 20, 2018. 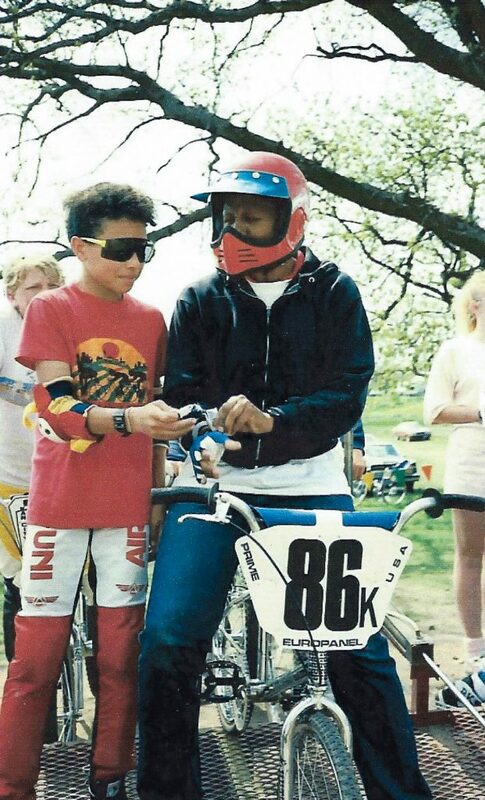 Bottom photo: Max Knauer assists Kittie Weston-Knauer as she prepares to start her first-ever BMX race on Mother’s Day of 1988. Courtesy of Kittie Weston-Knauer. Originally aired May 11, 2018, on NPR’s Morning Edition. Kittie Weston-Knauer (KWK): And it was Mother’s Day of ‘88, I did my very first race. I was 40. I borrowed your gloves, I borrowed your helmet. KWK: And I rode your bike. I was hanging on for dear life. I didn’t exactly tear up the track either. MK: At first, I was a little embarrassed, I guess. But you know, after doing it a little while and we were traveling together, it was great. I thought it was really cool how other mothers really looked up to you. But I was a little concerned. KWK: Right. I was paralyzed, from the shoulders down. But I was very determined that I was going to ride again. MK: Seeing you get back on the track, I was a little nervous at first, but you were doing what you loved to do. That was really inspiring. KWK: And people ask me, ’And you continue to race?’ And my answer is, ’Why not?’ As long as I can keep the two wheels on the ground, I’m good.